An artist's illustration depicts the European Extremely Large Telescope (E-ELT) in its enclosure. It eventually will be the world’s largest "eye on the sky." The world's largest telescope has gotten its official construction go-ahead, keeping the enormous instrument on track to start observing the heavens in 2024. The European Extremely Large Telescope (E-ELT), which will feature a light-collecting surface 128 feet (39 meters) wide, has been greenlit for construction atop Cerro Armazones in Chile's Atacama Desert, officials with the European Southern Observatory (ESO) announced Thursday (Dec. 4). The European Extremely Large Telescope (E-ELT) will eventually stand on the summit of Cerro Armazones, which is being leveled (upper left). A new wider road to the mountain stretches across the photo. Image released Dec. 4, 2014. 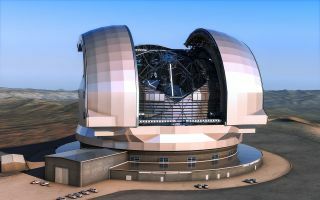 E-ELT construction was first approved in June 2012, but on the condition that contracts worth more than 2 million euros ($2.48 million at current exchange rates) could be awarded only after 90 percent of the total funding required to build the telescope (1.083 billion euros, or $1.34 billion, at 2012 prices) had been secured. An exception was made for "civil works," including the leveling of the site and a road up Cerro Armazones, ESO officials said. The 90-percent threshold was reached in October, when Poland agreed to join ESO, officials said, but making the numbers work took some tweaking. ESO split E-ELT development into two phases: 90 percent of the project's costs go toward "Phase 1," which will get E-ELT up and running, and 10 percent of the costs are allocated to "Phase 2," for the development of nonessential elements. These include about one-quarter of E-ELT's 798 individual mirror segments (which together make up the huge main mirror) and part of the telescope's adaptive optics system, which helps cancel out the blurring effects of Earth's atmosphere. The current construction approval applies only to Phase 1; contracts for this work will be awarded in late 2015. The Phase 2 components will be approved as more funding becomes available, ESO officials said. "The funds that are now committed will allow the construction of a fully working E-ELT that will be the most powerful of all the extremely large telescope projects currently planned, with superior light-collecting area and instrumentation," de Zeeuw said. "It will allow the initial characterization of Earth-mass exoplanets, the study of the resolved stellar populations in nearby galaxies as well as ultra-sensitive observations of the deep universe." As de Zeeuw said, E-ELT is not the only giant ground-based telescope in the works. The Giant Magellan Telescope (GMT) will soon start taking shape atop Las Campanas, another Chilean peak. GMT will arrange seven 27.6-foot-wide (8.4 m) primary mirrors into one light-collecting surface 80 feet (24 m) across; project officials are aiming for "first light" in 2021. And the Thirty Meter Telescope (TMT) — which, not surprisingly, will boast a light-collecting surface 30 m, or 98 feet, wide — is slated to start observing from Hawaii's Mauna Kea in 2022. Like E-ELT, TMT's primary mirror will be composed of hundreds of relatively small segments. All three megascopes should help researchers tackle some of the biggest questions in astronomy, including the nature of the mysterious dark matter and dark energy that make up most of the universe.